What expenses can I claim for tax purposes? An expense or part of an expense (when you can identify a suitable proportion) can be claimed as a deduction from taxable income for tax when it is incurred for the purposes of your business. Specific rules in statute and almost 100 years of tax case law have made this topic complicated. 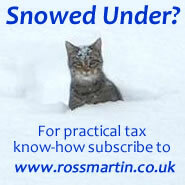 In this section we cover what you can claim for tax and we provides worked examples, FAQs, planning points and tips. These guides are for sole traders and partners. Click here for guides for Employers/employees. Motor expenses: two different ways of claiming your costs. Travel: the devil is in the detail, are those journeys really all for business, or are you just commuting? Subsistence: should carry a government health warning. Is your trade itinerant in nature, what does that really mean these days? Working from home: how much, why and when? Training costs and course fees: what is being achieved when you train yourself to do something? That may colour what you can claim. Repairs and maintenance: newly acquired assets, dilapidations, renewal or capital improvement? Employing the spouse and family: when wages and benefits are disallowed for tax. Living expenses: these are generally personal by nature so no claim is possible. More checklists under Self-employed > Tax planning & compliance. What expenses can you claim if you work in a certain type of business? This new section contains Subscriber guides that build up to summarise the key tax treatments for different types of sole trader, or partnership. Work out if there are any special rules for your particualr trade, profession, vocation. This section is building up week by week so watch this space. Having worked out what you can claim, relative to your trade, profession, vocation the next step is to chose the way to keep your records and report your business. Some of these rules become mandatory if you are adopting the cash basis. Some may be adopted voluntarily so you can in certain circumstances be free to "mix and match". Each business is different and so the right combination of claims and reliefs depends on you.